Photo by Vivian WheelerBread-heads, rejoice. 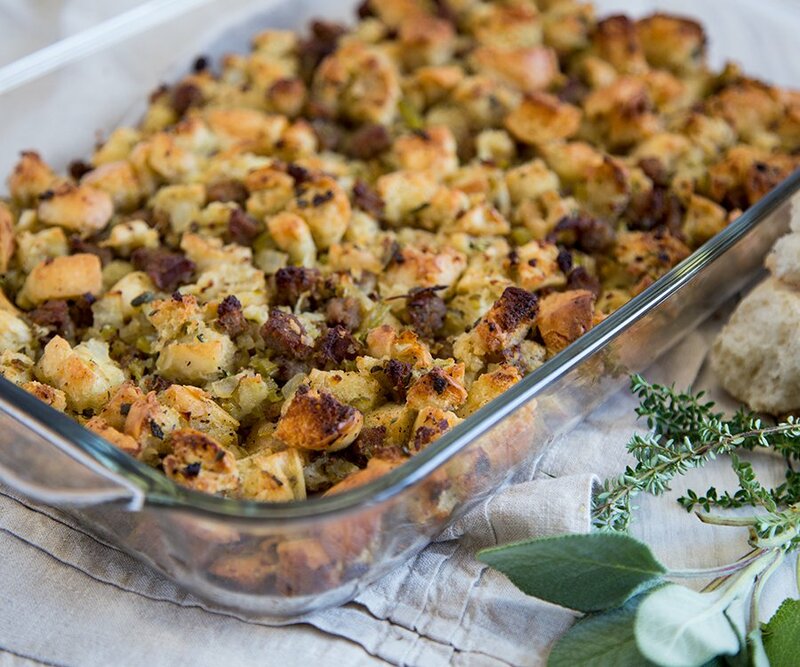 Fresh, local bread, sausage, herbs and more form the base of this Thanksgiving side dish. If you’re anything like us, when it comes to Thanksgiving dinner, stuffing—not turkey—is the true highlight of the meal. What’s not to love about a big pan of simple carbs gussied up with vegetables and herbs and soaked in poultry broth? Spread bread cubes evenly over baking sheets. Bake for 10 minutes. Check to see that bread is sufficiently dried. If not dry, toss cubes and put back in the oven for five minutes. While bread is drying, cook sausage in a large skillet with half a can of beer until cooked. Pull sausage from pan, slice into rounds and then quarter the rounds. Set aside in a large bowl. Drain any remaining beer. Melt butter in a large skillet. Saute onions and celery until tender. Add spices and saute for another minute then add mixture to bowl. Mix all ingredients together and add broth slowly until moistened but not too wet.